For springtime fun, we are making and collecting origami cranes in the library. We have origami paper and directions available at the front desk. Come on over and make a crane or two as a fun break from studying. 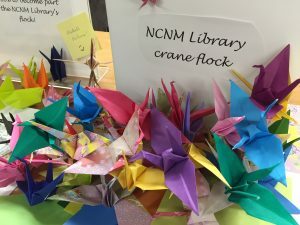 When you finish your crane, it can join the NUNM Library crane flock. We’re collecting the cranes in a ‘flock box’. When we have enough cranes gathered, library staff will turn the flock into a beautiful piece of art to hang in the front room of the library. Come help the flock grow!